You can use a Microsoft Windows server with local or directly attached storage as a backup repository. The storage can be a local disk, directly attached disk-based storage (such as a USB hard drive), or iSCSI/FC SAN LUN in case the server is connected into the SAN fabric. When any job addresses the backup repository, the Data Mover Service on the backup proxy establishes a connection with the Data Mover Service on the backup repository, enabling efficient data transfer over LAN or WAN. The Data Mover is installed automatically when you add a server to Veeam Backup & Replication as a managed server. Windows repositories can be configured to function as vPower NFS Servers. In this case, Veeam Backup & Replication will run the Veeam vPower NFS Service directly on the backup repository (namely, on the managing Windows server to which storage is attached) and provide ESX(i) hosts with transparent access to backed-up VM images stored on the backup repository. For more information, see Veeam vPower NFS Service. The machine must meet the system requirements. For more information, see System Requirements. The role of the repository can be assigned to a Microsoft Windows machine (physical or virtual). 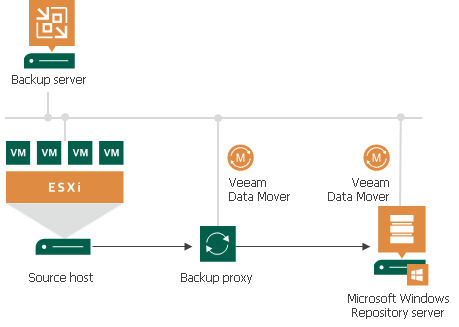 You must add the machine to the Veeam Backup & Replication console as a managed server.